On the rather large coach to Oxford, I felt comfortable sitting next to Tuscany. We were somewhat excited, but we both managed to hide this excitement and anxiety very well. To be honest, we were both trying hard to be cool about it. 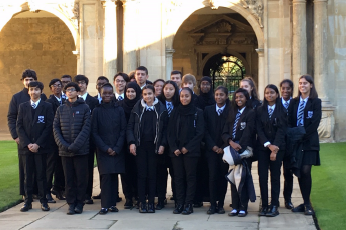 The 2nd of November 2018, a Friday, 25 specially selected Year 10 students were chosen to attend the Pathways Programme at St Johns College, Oxford. "Grateful" was not even enough to explain what I felt being chosen to experience this once-in-a-lifetime opportunity to see and experience first-hand what life as an Oxford student would be like. We killed the two hour ride with silly word games. When we turned into Oxford, the city, my excitement ran amok in my brains. What will I see?, who will I speak to?, will they ask me questions?, what if I don’t know what to say, what to ask or what to do even? We began seeing men and women wearing black cloaks and robes walking about with books or papers in their hands. Later I was told, they were going to classes. To me, they look like wizards, which I believe they are, as they are after all, teachers at the best university in the world. Once we entered the campus, we met Alex Lawrence, who read French Literature. He graduated with a First Class degree, the best anyone could achieve at Bachelor’s level and he was our host. He looked rather smart and reminded me of my old Drama teacher, Mr Barford. Alex was a good host and was informative. The whole campus was sick! We found out that the University was established in 1555. We were taken to St John’s College which really has a magnificent façade. I kept wondering how people in the 1500s could have built something so magical and beautiful. The new building is known as the bee hive, because of its distinctive shape and we saw the room that Tony Blair had when he studied there. 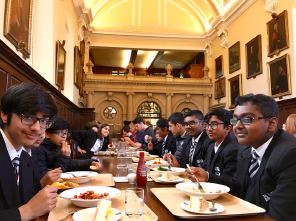 St John’s College is in fact the wealthiest college in Oxford University but has the cheapest and most affordable accommodation and food prices. I was shocked to know that meals at the hall cost less than my lunch in Whitmore! I thought I need to inform our Headteacher about this. A three-course lunch costs just £1.75, but the college can afford to subsidise meals for students. We had a quiz in a conference room about Oxford and I found out a lot about the famous alumni and some combinations of courses you could do at Oxford. Then we got a brief presentation about Oxford, the application process, some things about student finance and a session of Q&A with current students – it was really interesting to see how life is at Oxford and how the students felt about applying to Oxford. Then we did some interview questions in groups for different subjects – the questions were really hard. 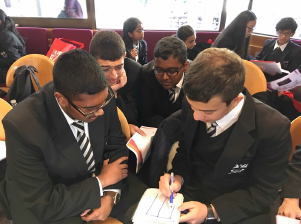 But I did notice, every question didn’t have a ‘real’ answer to it – it made me really think out of the box and I felt stupid that I was trying to find a right answer when what they wanted us to do was to challenge our minds and pick the interesting options. All those brain challenges left us hungry, so I was glad that we were taken to the very grand and posh canteen. We sat with other current students on what looked like antique chairs in this ancient canteen decorated with past alumni portraits. The ceiling was so high and had intricate patterns carved on it. The tables were long and big and old. After lunch, we went on a tour around the campus. We even saw St John’s heart kept in a vase right there in the chapel! We were taken to the library which the students said was haunted. 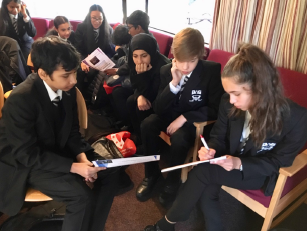 After all that walking, talking and questioning and challenging our brains, we set off again to where we belong with our goodie bags of useful things like a water bottle, a USB hard drive, plenty of brochures and post-its pads all emblazoned with the St John’s College logos. I have enjoyed my trip and will of course put Oxford as one of my choices on my UCAS form when the times comes. Being accepted will be another story.